﻿Is There a Cure for Aggressive Periodontitis? Is There a Cure for Aggressive Periodontitis? Aggressive periodontitis is more common than a lot of people think, nevertheless many people are unaware of the symptoms and occurrence of this disease. The most obvious features of the disease include hasty attachment loss and bone obliteration and genetic aggregation of the teeth. This can result in very early tooth loss if not tackled in a timely and efficient manner. The diagnosis of the disease is similar for all patients, but the treatment can vary from person to person due to their different characteristics and the intensity of the disease. It is definitely curable and should be treated as early as possible in order to avoid any kind of severe loss of the teeth. Unfortunately, once it has reached the very advanced stages, the patient would usually have a lot of bone loss and once the bone has gone it cannot be regenerated. This does not however mean that the disease cannot be successfully treated and managed, often without the need for surgery. It is possible to graft bone into the areas around the teeth by taking it from somewhere else in your body such as your hip or your ribs, but the problem with aggressive periodontitis is that the bone erodes away because of an exaggerated destructive response of your gums, and this excessive destructive process usually affects the grafted bone so it melts away as well. However, as I said, even in extreme cases, all is not lost. Textbooks state that if you lose more than a 3rd of the bone around your teeth the teeth have a hopeless prognosis and need to be extracted. That is very often what a dentist will tell their patient because this is what they have been taught. And from a ‘text book’ point of view, he/she is right. This is where the services of a periodontal expert can reap dividends. As a periodontal specialist in North London, I have been treating very advanced cases of periodontal disease with bone loss for many years and in most cases the condition can be managed and treated in different ways and in some cases very successfully without any tooth loss at all! Aggressive periodontitis is a disease much like the high blood pressure and diabetes which, whilst unfortunately cannot be completely cured, can be controlled and managed exceptionally well with medical treatment and specialist after care. Depending on the time of diagnosis and the intensity of the disease, the treatment will vary accordingly. If the disease is diagnosed at an early stage, then your periodontal specialist will have several options for treatment – one of which is Scaling and Root Planing. This works by removing plaque and calculus in all the areas around the teeth and gums and also flattening the surface of the root. Scaling and Root Planing treatment helps significantly in getting rid of the mouth bacteria which is mostly just along the gum line of the teeth. This kind of treatment works best where there is early stage detection of the disease or for cases which have not developed viciously. If the situation is severe and it is not timely diagnosed, then many periodontal specialists go for other complex treatments where periodontal surgery is highly likely to be the treatment proposed. This is the preferred surgical treatment for Aggressive periodontitis as suggested by many periodontal experts. The surgery repairs the loss and also prevents any further damage or loss of the gum bones. Gum graft surgery is done to cover roots and encourage development of new gum tissues on the gum line where there is a shortage excessive gingival recession. In graft surgery for gums, the surgeon takes the gum tissues from any relevant part of your body (for example your hip or rib) or any other donor’s source to fill the exposed root of the teeth. This filling is done tooth by tooth. It can be done either for one tooth or several teeth as per the requirement and condition of the root under each tooth until the gum line is completely recovered, and the sensitivity is reduced. As stated above, however, the problem with aggressive periodontitis is that the bone erodes away because of an exaggerated destructive response of your gums, and this excessive destructive process usually affects the grafted bone so it melts away as well. This is why I always propose looking at non-surgical and far less invasive treatments where at all possible. I have developed a practice over 20 years specializing in exactly that, and now lecture extensively on the subject of non-surgical treatment of periodontal disease, including aggressive periodontitis. Read more about my published work. In conclusion, Aggressive periodontitis can be a serious condition with a fairly grim prognosis if it is not caught and treated in a timely fashion. An early diagnosis of the disease involves far simpler treatment processes. Nevertheless, even severe or chronic conditions can sometimes be treated without the need for surgery. Of course, your periodontal specialist is the one to consult for an individual diagnosis and prognosis of your condition. I offer both telephone and face-to-face consultations and can work together with your own dentist to provide the best treatment plan for you. You can contact me here for further advice on periodontal treatment. Take care and I hope to hear from you soon. I’m interested in ways of treating periodontal disease in a way in which I won’t loose multiple teeth. Prognosis from my dentist was grim, they want to extract seven teeth, but I feel no pain. You ask about ways of treating gum disease without losing multiple teeth. Essentially there are only 2 ways of treating periodontal disease. Surgery or non-surgery. If the condition is too far gone and there has been too much loss of bone and gum tissue, then doing either treatment or both is not going to be effective. So, it all depends on how much of the gum and the bone around your teeth has been lost whether the teeth will be lost or not. However it has to be said some dentists and periodontists extract teeth early because they recognise that they have a poorer prognosis, whereas others recognise that not all teeth with a poor prognosis have to be extracted, and will try and carry on and keep as many teeth in your mouth as possible for as long as possible. Personally I tend to try and keep as many teeth in people’s mouths for as long as possible, but nor all periodontists and/or dentists do this. So, the answer may be that you need to get a 2nd opinion or a 3rd opinion and find someone who is prepared to keep your teeth going for as long as possible rather than extracting them and giving up on them early. However I have not seen you, and I have not seen how bad your gum condition is, so it may be that it has indeed gone too far and you may have to lose some teeth, but I cannot give you a diagnosis or treatment plan or any idea of whether you can retain your teeth will not. All I can do is give you some general guidelines like I did in the previous paragraph, and hopefully you have found those helpful. Hi! My name is Lule and from Kosova. I’m recently diagnosed with Agressive Periodontitis. My dentist told that I need to treat it immediately and it can only be treted out out my country with “open flap scaling and debridement” or/and “gingivectomy & gingivoplasty.My teeth from being “good teeth” are becoming in risk to loose as they have changed the form (looking longer) as well as they hurt. It all happened in a very short time. Can you please help? Yes Lule, it sounds as though your dentist is right, except that these days the tendency is not to use surgery. In most cases we can manage doing this simply by deep cleaning. I have no idea what the situation is in Kosovo, and you are always welcome to visit me in London if that is possible. However, as I do know what dental facilities are available in your region, I suggest that you find out at the local dental school/hospital if they have a periodontal department, and if they do then what the possibility of you having your condition treated would be. If a local dental school cannot help you, you may need to contact dental schools in other nearby countries, and do a bit of research to find a periodontist who is not too far away from you and can help you to bring this condition and control. Hi! I’m Michelle Montefalcon and I’m from the Philippines. I think I’m suffering from aggressive periodontitis and I’m hopeless that this will be cured. Right now, I’m taking sensedol as a supplement for my gums but it doesn’t get better. I always go to my dentist and have her check my conditions but she hasn’t really treated it. Maybe because this isn’t her specialty. Right now I’m wearing braces and some of the teeth are mobile because of my gum disease. I’m really scared I’m going to lose all my teeth. Please help me. I can’t afford to do surgery or any of the procedures mention. Yes Michelle, you are quite right to be worried! You will almost certainly lose your teeth if you do not get them treated, and clearly your general dentist cannot do so. What you need to do is to find a dentist who specialises in periodontal diseases (such as a periodontist) and get them to help you bring the condition under control. You are in the Philippines, and I happen to know that there are a number of periodontists in the Philippines, because I have trained a few of them who trained at the Eastman Dental Hospital in London. I am sorry that it has taken me so long to answer your question. It sounds to me like you are right. You do have gum disease and you are also right that needs to be treated. Surgery was almost always required to treat this in the past, but we tend to treat this without surgery these days. Not using surgery means deep cleaning, and you need to ask your dentist to do a deep cleaning underneath the gums to clear out all of the debris that has lodged there and you should find that it all clears up. If you can afford to go and see a periodontist, that is great, but if not maybe you could be referred to the periodontal Department in the dental school, if that is not too far away, and maybe they will be able to help you. I am afraid there is nothing that you can do until you get this tooth out and get a plate made. If there is a 12 week waiting list to get it done, this is a straightforward dental problem, so I would suggest that you consider shopping around and finding someone else can do it for you sooner. I’m a 26 year old with periodontal disease. Yes, I’m young but I never would’ve guessed because I brushed daily and stayed rather healthy. I recently got the LANAP laser surgery done on my entire mouth and it didn’t hurt at all. However, I since then I’ve had an aching/dull headache which I can’t distinguish if it’s referred pain from the scaling and planing they did after and I think it’s coming from my upper #3 tooth. Anyway, I’ve had a root canal on it and still no relief. Should I just take it out?? I’m really regretting all of it. I mean I would rather live with periodontal disease and pain free than without it and be in constant pain the rest of my life. My opinion from experience is if it’s not hurting you leave it alone. 1st and foremost, the fact that you have had laser treatment all over your mouth for periodontal disease is irrelevant! What is relevant is whether you had a full periodontal charting done for the treatment, and then you had a follow-up appointment to have a 2nd periodontal charting done to assess how effective the treatment was, and if you really have got periodontal disease at this young age, you should be having regular follow-up appointments to keep the condition under control. A “quick flash” laser treatment is simply not going to do it! There is a huge media hype about using lasers to treat periodontal disease, because it is said it is painless and an instant solution to the problem, well, it simply is not ! You will probably require treatment for this condition by conventional therapy as frequently as 3 monthly, indefinitely, and repeatedly. There is no such thing as an instant flash treatment for this condition and you have to accept that you will need top up treatments regularly in the future. Having the tooth out is going to help even less than having a burst of laser treatment. Secondly, your headaches and your toothache are probably not being caused by the treatment and the fact that you had a root treatment done and it has not helped implies that there is something else going on that is causing all of this trouble. So, what you need to do is to see a specialist like a periodontist for a proper diagnosis and treatment and assessment of where the pain is coming from, without looking for instant solutions like having teeth out, because that will almost certainly not solve the problem. I have recently been to Liverpool dental hosp who said I had a aggressive periodontal disease which he reckons I have had for at least 8 years and was going to recommend to my local dentist to remove my 2 front teeth and replace with false ones. Firstly should I be angry with my dentist for not seeing this problem before now and secondly is there anything else I can do to save all of my teeth. I pay for them to be cleaned every 3 months by a dental hygienist. What can I do ? This is a very big problem in that when aggressive periodontitis takes hold it is very difficult to stop and bring under control. Obviously the earlier that it is treated the more likely that it is that the teeth affected will be saved, but this is not always possible, even with treatment. So, maybe you should be angry with your dentist for not doing something about it earlier or maybe not! Even at this late stage it is sometimes possible to keep the teeth in your mouth by cleaning underneath the gums, and maybe gluing them to the other teeth with a splint. Even if you lost teeth, there are other treatments like implants that might be possible to be used to replace missing teeth later on, when the active phase of this condition has stabilised. Of course, I have not seen your mouth, so I do not know how bad the problem is, but it might be useful for you to see a specialist periodontist for an opinion and advice on what options may be possible for you. After I caught a respiratory virus (most likely coxsackievirus B4, by my viral blood tests) which triggered a number of health problems in me, I noticed that I suddenly developed receding gums (periodontal disease). Prior to catching that virus, my gums had always been pink and healthy. As this coxsackievirus spread to friends and family, it also caused several of these people to developed sudden onset periodontal disease (quite a few people commented that their gums suddenly went downhill). I am not sure exactly of the mechanism by which coxsackievirus B could cause periodontitis, but my guess is that it may involve the connective tissue-destroying enzyme MMP-9, which has been shown to be elevated in coxsackievirus B infections. Note that in chronic infections, coxsackievirus B is hard to detect, and usually it is only the plaque reduction neutralization blood test (no connection to dental plaque) that is sensitive enough to reveal these chronic infections. As far as the research establishment is concerned, periodontal disease is caused by bacterial infection and there are about 6 bacteria that are considered to be the causative agents. Many people have these bacteria in their mouths and don’t have periodontal disease, so questions have arisen as to whether this model of the cause of periodontal diseases is purely down to these few bacteria. These bacteria are only 6 out of an estimated 450 other bacteria that normally inhabit the mouth, many of which have the potential to cause periodontal disease. Also the mouth is populated by fungi, and of course, viruses all of which are known to cause tissue damage, but very often don’t. So there is something more to this story and it is now recognised that the causes of periodontal disease are multifactorial. Of the many potential causative factors in periodontal disease the current favourites come down to the competence of the immune system and how it manages infections and deals with other factors that may lead to periodontal disease. Very, very few papers have been published on the role of viruses in causing periodontal disease. I only know of only a few papers on the subject, some identifying herpes, and also with Epstein-Barr virus. I know of no work that is ever considered Coxsackie virus so I found this post very interesting and it makes a lot of sense. Whether it is the virus stimulating MMPs (matrix metalloproteinases,) or whether it is the immune system which is not coping with the infection, that then goes into overdrive and produces an over abundance of these tissue destructive enzymes to try and protect the body from the encroaching infection, I do not know. Either way you have an infection and the immune system either reacts, or overreacts to it and that leads to tissue breakdown which in your mouth may manifest as periodontal disease or it may manifest in other parts of the body. I don’t think anyone fully understands the exact interplay between organisms and our immune systems, but this is a very interesting and useful post. I’ll explore a bit further and follow this up if I find any other information. Thanks very much for your response. I am glad you find the info useful. Let me add a few more details if I may about the rapid changes in dental health myself and some others who caught this suspected Coxsackie B virus experienced. In addition to the sudden onset of receding gums after catching this virus, myself and others also found there was a sudden increase in brown plaque deposition on the teeth. I had little or no plaque on my teeth before catching the virus, but after catching it more plaque suddenly appeared, especially on the areas of my teeth newly exposed by the receding gum line. You can see a picture of my gums and the brown plaque on my website here: https://chronicsorethroat.wordpress.com . Fortunately my gums have stabilized, and have not receded much further. I understand that plaque is a bacterial biofilm, so this sudden increase in brown plaque perhaps suggests that this chronic viral infection caused some immune suppression/modulation that allowed existing bacteria in my mouth to become more active. And perhaps these bacteria also played a role in the gum recession. I am of course doing a lot of speculative guessing here, because I have not had any blood tests to measure levels of these connective tissue-degrading enzymes. I hope this further info is of interest. Yes Hip, it’s of great interest! Thank you so much for taking the time and trouble to write about all this and making this information available. I can tell you that there is very little, if anything, in the literature about this subject, and I would like your permission (without giving your name or any contact details if you so wish) to the editors of some of the dental journals to bring this the attention of the dental profession. Would you mind if I did disseminate this information further? I look forward to receiving your approval to pass this information on. I am very happy for you to pass this information on, including my name and contact details, if this is useful (I can email those details to you). Another thing that relates to this is the known association between periodontal disease and heart disease. I was aware of this link from just from general knowledge, and of the hypothesis that bacteria in from the gums might migrate to the heart and instigate heart disease. But when I witnessed my virus spreading to 30+ friends and family, and saw how it triggered three heart attacks in the previously healthy soon after they contracted it (40% of sudden fatal heart attacks have been linked to enterovirus infection in the heart, see: http://www.ncbi.nlm.nih.gov/pubmed/18061067), as well as observing the sudden onset of receding gums in myself and in a few others with this virus, I started to wonder whether a chronic low-level viral infection might better explain the periodontitis — heart disease connection. I’m was diagnosed with aggressive periodontitis at the age of 22 after the removal of braces. Most of the doctor said its in the last stage and asked to extract most of my teeth as it was very mobile. But one of my doctors decided to save my teeth. So I underwent 6 bone graft surgeries, multiple root canal treatment, then he he had to grind the upper incissors and 2 more teeth beside it. Now I am wearing a crown for all the 4 teeth but its only temporary. I also have splinters in my lower teeth. Doctor said I cannot opt for permanent solution as my gums are weak and the takes extremely long time to cure and most of the anestitics don’t won’t on me during surgery due to this condition. Could you please suggest a permanent solution doctor? 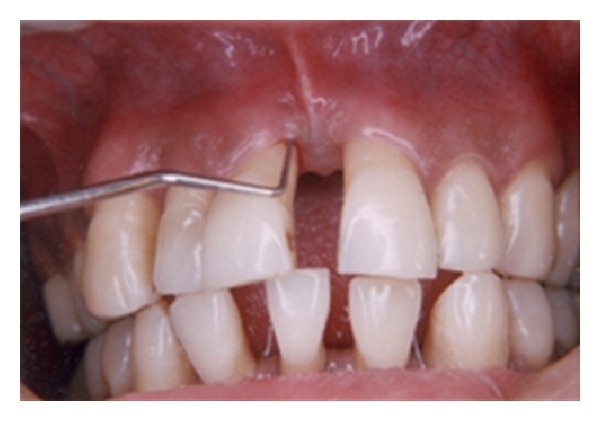 Aggressive periodontal disease is a very destructive form of periodontal disease. It is very difficult to treat effectively, so this is going to be a long term battle. The good news is that often it burns itself out before you are 30 years old in most cases, and then slows down after that. To preserve as many of your teeth as possible for as long as possible I would arrange to see A dental professional every 3 months to make sure that the condition is kept under control as best as possible, But also you must make sure that you keep your plaque control under perfect, or nearly perfect control at all times. Very often this needs specialist Management in a specialist environment so you may need to see a periodontist and/or the hygienist in a specialist periodontal practice to make sure that they are not just cleaning and polishing your teeth, but managing the gum problem as well. Also, you can have some good quality temporary crowns made that look good and feel good and should last for a few years so discuss this with your dentist and hopefully in a few years time when it has all settled down you can have more permanent one is placed.